Gone are the days when the success of a campaign is measured by the thickness of a cuttings book, and the most technical measure of the value of a campaign is an advertising value equivalent (AVE). The explosion of data available to communicators has led to huge advances in how the comms industry is able to measure and attribute value to the work it does. However, another revolution is already sending tremors through the industry; artificial intelligence. Reacting to this shift, next month’s AMEC summit – the annual gathering of PR’s “measurati” – is focused on analytics, algorithms and augmentation. 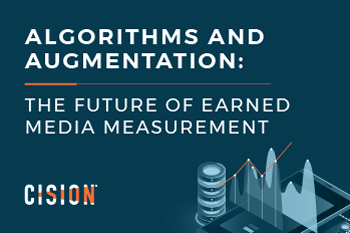 Ahead of the summit, we’re delighted that AMEC global managing director Johna Burke and Cision Insights COO Timo Thomann-Rompf will join us to discuss the latest earned media measurement trend in our latest webinar. The pair will present their view on why algorithms and augmentation have become as critical to measurement as analytics, showcase examples of how communicators are using the 3 As to sharpen their work and offering their view on the current industry landscape.